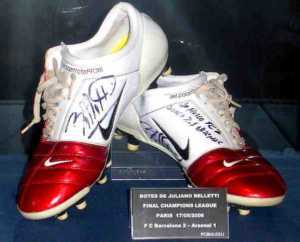 Juliano Belletti’s Nike shoes worn in the 2006 UEFA Champions League Final. Nike Inc.’s corporate mission statement and corporate vision statement focus on top performance in the athletic and leisure footwear, apparel, and sports equipment industries. (Photo: Public Domain). Nike Inc.’s corporate mission and vision statements evolve to accurately represent the company’s position as the leading athletic shoes and apparel supplier in the global market. A company’s corporate mission statement defines the fundamental objectives of the business, especially in terms of its purpose. In this company analysis case, Nike’s mission statement prompts the business to support the endeavors of athletes. On the other hand, a company’s corporate vision statement provides a picture of a target future condition of the business. Nike’s vision statement focuses on brand strength and development. The company applies these corporate statements as guides for the evolution of its business, leading to the creation of business strengths like a strong brand image, as determined in the SWOT analysis of Nike Inc. Through the evolution and effective implementation of its corporate vision and mission statements, the company supports its market position as a leading producer of sports footwear, apparel and equipment. In implementing its corporate vision and mission statements, Nike Inc. aims for leadership in the international market, while counteracting competition. The Porter’s Five Forces analysis of Nike Inc. shows that competitive rivalry imposes a strong force against the company and its industry environment. The corporate mission and vision statements compel the company’s strategic management to develop policies to ensure competitiveness against other firms, such as Adidas, Puma, ASICS, Under Armour, and VF Corporation. These firms make the global athletic and leisure shoes, apparel and equipment market a challenging business environment. As a leading manufacturer of sports shoes, apparel and equipment, Nike Inc. inspires people to adopt a “winner mindset”, which is covered in the “inspiration” component of the mission statement. The company’s slogan “Just Do It” represents this inspirational goal. Also, Nike’s corporate mission statement emphasizes innovation. This component is applied through the company’s strategy of continuous improvement of products through new technologies, as included in Nike Inc.’s generic competitive strategy and intensive growth strategies. The “every athlete in the world” component indicates that the company’s corporate mission pushes the business to target every consumer in the world. As noted, the company considers every person an athlete. Thus, based on this corporate mission, Nike’s products are designed to attract and satisfy a wide variety of market segments globally. Nike’s vision statement uses the word “remain,” which indicates that the company already considers its brand as the most authentic, connected, and distinctive in the global market for sporting goods and related products. The “authentic” component of the corporate vision statement shows that the company aims to make its products deliver high performance to consumers. On the other hand, the “connected” component is about ensuring consumers’ personal connection with the brand. Nike’s marketing mix or 4P supports the creation and maintenance of such connection with customers. The company also maintains distinctiveness by delivering the best possible products to the market. This corporate vision regards Nike Inc. as a leader in the industry, while pushing the business to further separate itself from competitors. A notable point about the company is it also develops connections with consumers through its vision for corporate social responsibility: “to help NIKE, Inc. and our consumers thrive in a sustainable economy where people, profit and planet are in balance.” This vision serves as basis for Nike Inc.’s corporate social responsibility strategy and stakeholder management approaches. Nike’s mission statement outlines the general strategic direction of the business. The statement includes such information as the company’s customers (everybody), the target market (global), and part of the philosophy of the business. These are strong points, based on conventions in writing ideal mission statements. However, Nike’s corporate mission is philosophical and does not include specifics about the kind of products offered to consumers and the nature of business processes. In this regard, it is appropriate to recommend that the company specify the nature of its products. For example, Nike can improve its corporate mission statement by illustrating that its products are in the athletic and leisure footwear, apparel, and equipment industry. Also, stating that business processes are within the scope of the design and manufacture of such products can make the corporate mission statement more accurate and suited to Nike’s operations. Nike’s vision statement is about keeping the leading brand in the global industry. The company considers its brand as one of the major strengths of the business, and points out that it has already achieved the top brand position. In this regard, Nike’s corporate vision statement is satisfactory in terms of having the characteristics of the ideal vision statement. For example, the company’s corporate vision statement is concise, clear, inspiring, and challenging in focusing on maintaining the leading brand. The statement is also future-oriented, considering that Nike Inc. highlights keeping its brand’s leading position as a strategic aim for future business development. Abiodun, A. J. (2010). Interface between corporate vision, mission and production and operations management. Global Journal of Management and Business Research, 10(2), 18-22. Bartkus, B., Glassman, M., & McAfee, B. (2006). Mission statement quality and financial performance. European Management Journal, 24(1), 86-94. Cochran, D. S., David, F. R., & Gibson, C. K. (2008). A framework for developing an effective mission statement. Journal of Business Strategies, 25(2), 27. D’Urso, S. C. (2018). Towards the final frontier: Using strategic communication activities to engage the latent public as a key stakeholder in a corporate mission. International Journal of Strategic Communication, 12(3), 288-307. David, F. R. (2003). Its time to redraft your mission statement. Journal of Business Strategy, 24(1), 11-14. Kirkpatrick, S. A., Wofford, J. C., & Baum, J. R. (2002). Measuring motive imagery contained in the vision statement. The Leadership Quarterly, 13(2), 139-150. Lucas, J. R. (1998). Anatomy of a vision statement. Management Review, 87(2), 22. Marjanova Jovanov, T., & Fotov, R. (2014). Corporate mission: Much ado about nothing or essential strategic step? International Journal of Arts and Sciences, 170-182. Nike, Inc. – Form 10-K.
Scott, J. (2016). What is a thirteener? Empowering your teams will help you successfully implement your corporate vision. Strategic Finance, 98(5), 12-13. Slack, F. J., Orife, J. N., & Anderson, F. P. (2010). Effects of commitment to corporate vision on employee satisfaction with their organization: An empirical study in the United States. International Journal of Management, 27(3), 421. Suranga, J. M. (2017, March). Importance of Corporate Vision. In Proceedings of International HR Conference, 1(1), 34-40. U.S. Department of Commerce – International Trade Administration – Textiles, Apparel & Sporting Goods. U.S. Department of Commerce – International Trade Administration – The Consumer Goods Industry in the United States.